WASHINGTON — Einride, a Swedish technology startup that plans to begin moving cargo in that country later this year with unmanned, all-electric vehicles, recently showcased its vision for freight transportation to industry researchers in the United States. Einride’s battery-electric “T-pod,” hailed by the company as an entirely new vehicle type, has no cab or driver’s seat and roughly resembles an autonomous pup trailer. In lieu of the traditional driver, back-office workers will remotely monitor and, when needed, remotely control the self-driving T-pod. The vehicle was on display in the exhibit hall at the Transportation Research Board’s annual meeting, held here Jan. 7-11. “I think the industry will look radically different in 10 to 15 years,” Einride CEO Robert Falck said in an interview with Transport Topics. By combining autonomous operation with electric propulsion, the T-pod can provide emission-free transportation at a cost that’s competitive with conventional diesel trucks, Falck said. Apart from reducing fuel expenses, the self-driving vehicles will be able to operate around the clock, unlike human drivers who are constrained by hours-of-service limits, he added. Falck said he believes society is ready for driverless vehicles on public roads. “We’ve been doing this kind of automation in factories for 30 to 40 years. We do it in harbors. … We do it within mines. The only thing we’re doing is expanding the scope a little bit,” he said. European supermarket chain Lindl will use Einride’s vehicles to move goods over the road in southern Sweden as part of a pilot program set to begin in the third quarter. The T-pod, designed to carry up to 15 standard European pallets, is about 23 feet long and weighs 33,000 pounds at full capacity. Its battery capacity is 200 kilowatt hours, enabling a range of about 125 miles on a single charge. The price per unit will be roughly $150,000, Falck said. Einride has designed its T-pods for specific uses, such as regional linehaul routes where businesses are shipping high volumes of freight between hubs. “We’re not going to do everything. We’re looking for the right applications,” Falck said. In Sweden, Einride is developing a T-pod route with charging infrastructure between Gothenburg and Helsingborg, cities separated by about 125 miles. Einride aims to have 200 T-pods operating on that route by 2020. The Stockholm-based company, formed in 2016, also is interested in entering the North American market. 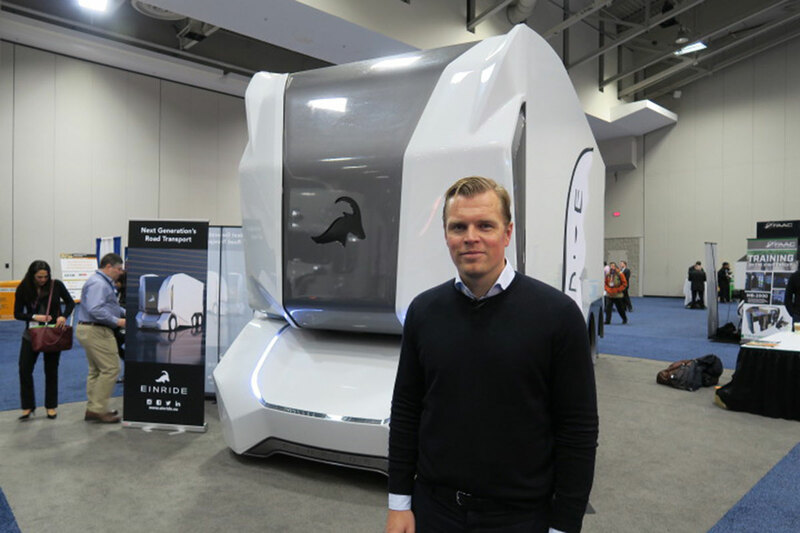 Einride will not be competing in inner-city delivery or coast-to-coast longhaul, he said, but could deploy the T-pods on regional routes connecting hubs in nearby cities, such as Baltimore and Washington, D.C. Beyond 300 miles or so, it makes more sense to consolidate shipments in large trailers, he added. Falck described the T-pod’s self-driving capabilities as Level 4 autonomy, meaning the vehicle can handle all aspects of driving under certain conditions without the need for a driver to intervene. The T-pod uses lidar and radar sensors and a machine vision system to track its surroundings. Einride plans to begin operating with one remote driver per vehicle on the road, but over time, the company aims to expand that ratio until each remote driver is overseeing about 10 vehicles, Falck said. Another company working on remotely controlled trucks is Starsky Robotics. The San Francisco-based startup firm is developing a remote-control and self-driving system designed to retrofit on standard Class 8 trucks.